Hush now speculators! 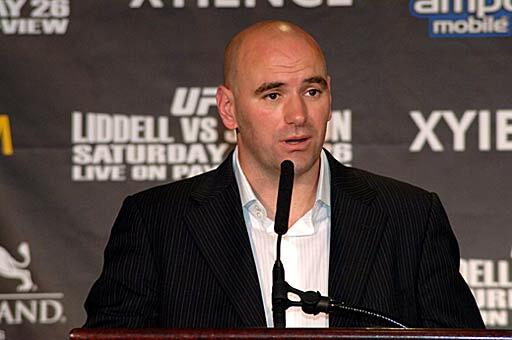 Dana White got some words about Chael Sonnen's failed dope test. Read the president's lengthy talk and understand it very well. We’ve already heard from everyone about Chael Sonnen’s failed drug test and use of PEDs over the last week or so. We’ve heard from every one other than Dana White. Until today, that is. “Here’s the thing you guys have got to understand. I’ve been in this business for 10 years. I’ve been in the fight business since I was 19. There’s a lot of stuff you guys don’t know. Every day, when my big toe hits the floor and I get out of bed, that sh*t happens. I have to deal with it. It’s no different than any other day. Am I disappointed? Yes, absolutely… The big misconception is that Dana tells the athletic commission this and that. I don’t tell the athletic commission jack sh*t. The athletic commission could give a flying rat’s a*s what I think or what I have to say. They oversee me. They tell me what I’ve got to do. I have to sit back now and see what’s going to happen.